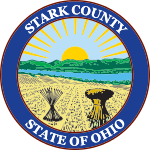 Longtime efforts by community leaders in Stark County, Ohio, to create a new countywide Internet network have recently taken important steps forward. In the past few months, three local government agencies approved informal resolutions to explore building the proposed network, including the City Council in Canton, the Stark County commissioners, and the trustees in Jackson Township. County population is about 375,000 within the 575 square miles located in the northeast section of the state. In May, an all-volunteer organization comprised of local leaders called the Stark County Broadband Task Team (SCBBTT) announced that they had raised $100,000 needed to fund a feasibility study to explore the construction of the network. The SCBBTT also recently announced they hired a consultant to conduct the study. Stagnant countywide population growth has been a problem for Stark County in recent years. This is partly explained by the dramatic decline in the county’s manufacturing economy as the county has lost approximately 34 percent of its goods-producing jobs since the new millennium began. Meanwhile, Stark County leaders know that emerging industries are demanding fast, reliable, affordable connectivity - not what’s currently available in Stark County. County leaders believe that the new network can provide a “transformational” force toward attracting tech-driven businesses and young professionals. As Ohio's manufacturing industry declines, other communities in the Buckeye State are considering fiber connectivity a way to attract job creators. We have recently reported on Hudson and Fairlawn, where community leaders know better connectivity will improve services for residents and businesses. Upper Arlington is also planning on offering dark services to businesses interested in making use of its publicly owned fiber. Publicly owned Internet infrastructure can become the foundation for a revitalized economy in Stark County. With support from local government leaders and a strong group of volunteers driving the effort, they are headed in the right direction.